To Cite: Golbabaei A, Aghaei Moghaddam E, Majnoun M T, Sanei Motlagh A. 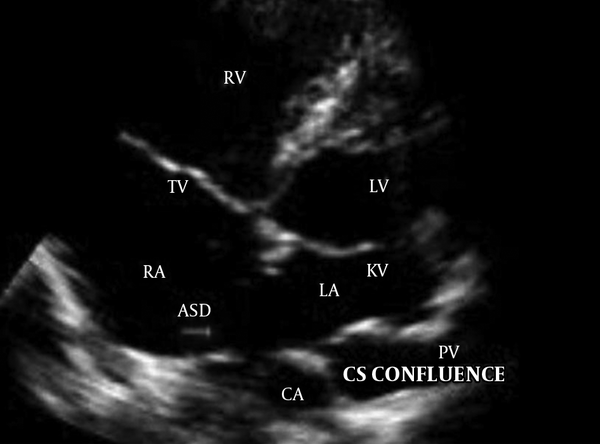 Mixed Type Total Anomalous Pulmonary Venous Connection in a Newborn, Multidiscip Cardio Annal. 2018 ; 9(1):e62512. doi: 10.5812/mcardia.62512. Total anomalous pulmonary venous connection (TAPVC) is referred to a specific condition in which there is no direct connection between any pulmonary veins and the left atrium. In this report, we describe a case of mixed type TAPVC in a newborn. The surgical correction of anomaly was successful. The child had an uneventful post-op recovery and was discharged. 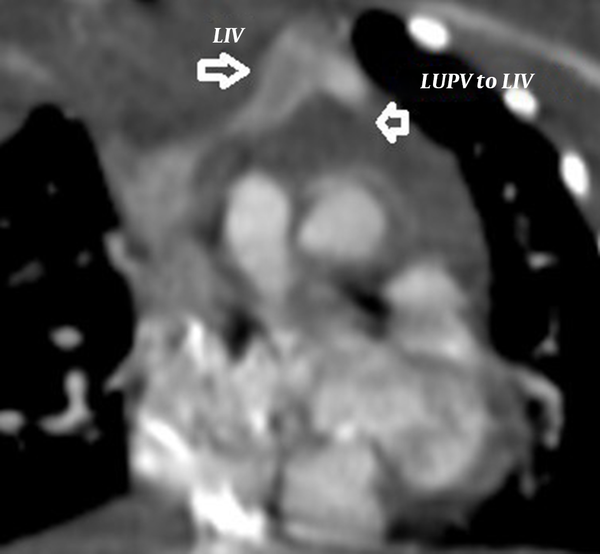 Total anomalous pulmonary venous connection (TAPVC) is referred to a specific condition in which there is no direct connection between any pulmonary veins and the left atrium. All pulmonary veins connect to the right atrium or one of its tributaries. 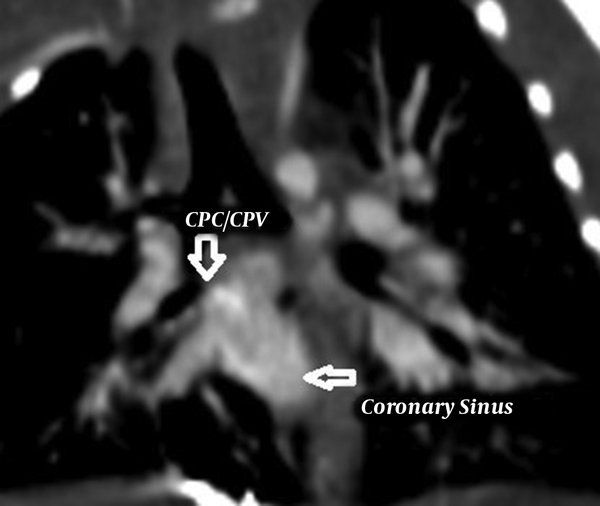 In mixed type TAPVC, there is no common pulmonary venous sinus, and pulmonary veins connect randomly to the heart. TAPVC was first described by James Wilson in 1798 in the autopsy of an infant with ectopia cordis and other congenital malformation (1, 2). Mixed variety of TAPVC is a rare cardiac malformation and includes 5% - 10% of these cases, but wide variations of pulmonary venous anatomy are reported that can make surgery more challenging (1, 3). In this report, we describe an infant who was diagnosed with a mixed type of TAPVC. A neonate was referred to pediatric center who was diagnosed with total anomalous pulmonary venous connection (TAPVC) on the second day of life. The baby boy 3.2 kg in weight with tachypnea, central cyanosis, and respiratory distress was admitted for further examinations. A loud P2 murmur on upper the left sternal border was heard. Electrocardiogram showed normal sinus rhythm with right axis deviation. Echocardiography revealed the enlargement of both right atrium and right ventricle. Relative diminution of the left atrium and ventricle was also evident. Base on Doppler echocardiography, the right-sided pulmonary veins with the left inferior pulmonary vein formed a confluence and drained via the common chamber to coronary sinus (Figure 1). The left upper pulmonary vein drained via a vertical vein to left innominate vein. There was also an atrial septal defect (ASD) with 5mm in diameter (Figure 2). Right to left shunt was evident with severe pulmonary artery hypertension. There was no patent ductus arteriosus (PDA). Computed tomography angiography (CTA) also supported these findings and determined the diagnosis of TAPVC (Figures 3 - 5). So the child was candidate for surgery and it was performed at the day 12 after birth. Under general anesthesia and sterile conditions, sternotomy was performed. After pericardiotomy abnormal pulmonary veins were appeared and separated by vessel tapes. Cardiopulmonary bypass (CPB) was done with aortic and bicaval venous cannulation. Cardiac arrest was induced by antegrade cardioplegia and then mild hypothermia. 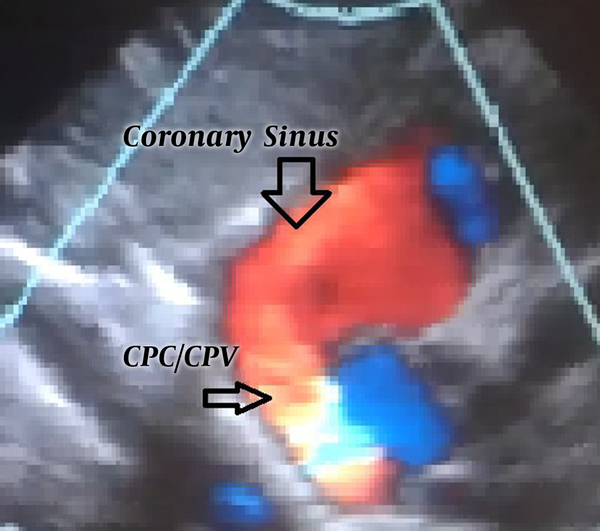 The roof of left coronary sinus adjacent to the left atrium (LA) was excised, then connection between the confluent of pulmonary veins (CPV) and LA was established. The left upper pulmonary vein remained intact. Due to the avoidance of right heart failure, surgeon partially closed the ASD and held open 2 millimeters of the hole. The child was weaned off CPB with the support of inotropes. He transferred to pediatric intensive care unit with stable hemodynamics. This course was uneventful and post-operative echocardiography was normal. Due to follow-up echocardiography, there was no sign of stenosis in coronary sinus to LA anastomosis (unroofing area). The child was in a good state of health and weight was acceptable. Subcostal short axis view in Dopler echocardiography. Figure 2. 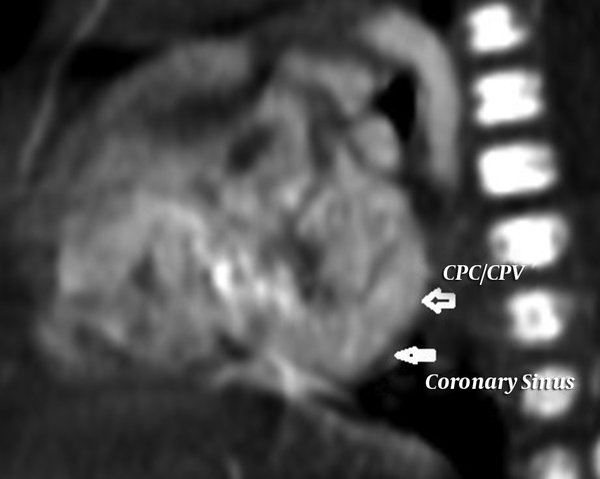 Apical four-chamber view showed common pulmonary chamber (CPC)/confluence of pulmonary veins (CPV). An atrial septal defect (ASD) with 5mm in diameter was also evident. The correct diagnosis and accurate anatomical description of TAPVC is necessary for planning the surgery. Accomplishing the detection in the mixed type of anomalous is difficult. Echocardiography is sufficient for diagnosis in most cases, but the definitive diagnosis and determination of the anatomical location of the vessels is based on the results of the computed tomography. In TAPVC, the pulmonary venous blood returns to right side of the heart directly or by combination with coronary sinus or systemic veins. It may lead to pulmonary hypertension; so symptoms of pulmonary congestion and right heart failure are expected (4, 5). Total anomalous pulmonary vein connection is the disease in which structural changes of pulmonary circulation including arterial wall thickness is present in all types. With the development of pulmonary hypertension, septum grows with the right ventricle and their growth together overtakes that of the left (6). Surgical correction for TAPVC can be beneficial, but complications including severe preoperative cardiopulmonary instability in infants with obstruction, postoperative paroxysmal pulmonary hypertension, and delayed development and progression of pulmonary vein stenosis are still expected (1). Despite the poor condition and severe pulmonary hypertension before the surgery, our patient was discharged with good state. Immediate correction of anomaly and hemodynamic status should be considered. The more the surgery is delayed, the worse the child's condition becomes. By the progression of pulmonary hypertensive crisis, higher mortality rates are expected. In this case, the surgeon did not completely close the ASD, and let the right ventricular pressure to be adjusted for prevention of right heart failure. Conflicts of Interest: The authors declare that they have no conflicts of interests. Consent: Written informed consent was not available because of change of residence but oral agreement from the patient was obtained. 1. Kouchoukos NT, Blackstone EH, Hanley FL, Kirklin JK. Kirklin barratt boyes cardiac surgery. Total anomalous pulmonary venous connection. 4 ed. Philadelphia: Elsevier; 2013. 1183 p.
2. Wilson J, Baillie M. A description of a very unusual formation of the human heart, By Mr. James wilson, surgeon, communicated by matthew baillie, m. D. F. R. S. Philos Trans R Soc Lond. 1798;88(0):346-56. doi: 10.1098/rstl.1798.0014. 3. Chowdhury UK, Airan B, Malhotra A, Bisoi AK, Saxena A, Kothari SS, et al. Mixed total anomalous pulmonary venous connection, anatomic variations, surgical approach, techniques, and results. J Thorac Cardiovasc Surg. 2008;135(1):106-16. doi: 10.1016/j.jtcvs.2007.08.028. [PubMed: 18179926]. 4. Chowdhury UK, Malhotra A, Kothari SS, Reddy SK, Mishra AK, Pradeep KK, et al. A suggested new surgical classification for mixed totally anomalous pulmonary venous connection. Cardiol Young. 2007;17(4):342-53. doi: 10.1017/S104795110700073X. [PubMed: 17588283]. 5. Rosenquist GC, Kelly JL, Chandra R, Ruckman RN, Galioto FJ, Midgley FM, et al. Small left atrium and change in contour of the ventricular septum in total anomalous pulmonary venous connection: a morphometric analysis of 22 infant hearts. Am J Cardiol. 1985;55(6):777-82. [PubMed: 3976524]. 6. Haworth SG, Reid L. Structural study of pulmonary circulation and of heart in total anomalous pulmonary venous return in early infancy. Br Heart J. 1977;39(1):80-92. [PubMed: 137733].